An unsurpassed track record of steel mill descale solutions, delivering reliability in descale systems worldwide. 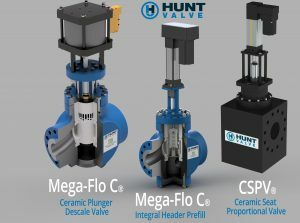 Our valves and system components deliver the highest durability and reliability in the industry, significantly decreasing the need for routine maintenance and component replacement and lowering the high accompanying cost. We continue to lead the industry in descale technology by incorporating the latest materials and control options for plunger- and poppet-style designs. Safety. Dependability. Reliability. That’s what industrial and military manufacturing customers around the world demand from their severe-duty valves and hydraulic system components. When you need to safeguard and control the flow and movement of material, Hunt can design a customized automation solutions for your application.